Tata Communications Payment Solutions Limited (TCPSL), a wholly-owned subsidiary of Tata Communications Limited, today launches 'Indicash' in Nagpur at Nandanwan. This is in keeping with the Reserve Bank of India's (RBI) vision to accelerate growth and improve ATM penetration across the country. Today, the company also achieved the milestone of deploying 100th Indicash ATM in Nagpur itself at Friends Colony Chowk. TCPSL's first white-label ATM, was launched in Chandrapada village, Thane District, Maharashtra on the 27th of June 2013. TCPSL plans to deploy at least 1,000 Indicash ATMs in Maharashtra, a region which will play a vital role in the company's rollout of 15,000 Indicash ATMs across India, over the next three years. TCPSL's aim of enabling financial empowerment across India will see a strong focus on regions like Maharashtra to uplift tier 3 to 6 locations. Phase one (to be completed by the end of September 2013) will see TCPSL roll out atleast 200 Indicash ATMs in Maharashtra, covering districts such as Nagpur, Pune, Kolhapur, Thane, Nasik and Ahmednagar. Of which, TCPSL will be deploying over 15 ATMs in the Nagpur district across key locations in the city and semi-urban as well as rural locations. Sanjeev Patel, CEO, Tata Communications Payment Solutions Limited says, "Nagpur is the third largest city in Maharashtra after Mumbai and Pune. It is an important hub for us to drive accessibility of alternate banking channels like the ATM networks. The launch of Indicash will enable transaction possibilities in areas which have until now been either out of the purview or had very minimal banking infrastructure, thus benefiting both local residents and businesses. Indicash ATMs have been designed to provide a user-friendly and intuitive consumer interface that will simplify the banking experience for the end user". Indicash was designed on the back of in-depth consumer research conducted by TCPSL across the country. It analyzed the main concerns surrounding the use of ATMs and found these to be primarily the short dispensation of cash, difficult user interfaces, swallowing of ATM cards by the machine and privacy/ security issues- especially in tier 3 cities and rural locations. All Indicash ATMs have been designed to guard against these situations, making banking safer, more reliable and stress-free. Key features include: Dip machines that ensure cards are not swallowed by the machine; an interface that has been designed to be intuitive and simple with multilingual messaging; and privacy screen filters, key pad shields and electronic surveillance to enable secure transactions. For Nagpur and the rest of the state, these ATMs have been customized for Maharashtra with menu instructions in Marathi. Along with regular cash and non-cash services such as cash withdrawals, balance enquiries, mini-statements and PIN changes, Indicash plans to offer value-added and utility services to customers with offers and third party promotions in the second phase of its roll-out. 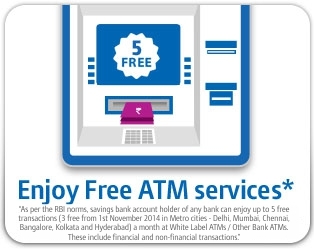 As per RBI regulations for use of 'other bank ATMs', Indicash will accept all domestic debit cards with the first five transactions per month being free.